Two men are being treated in hospital for serious injuries after the car they were in crashed into a lamp-post in Midlothian. 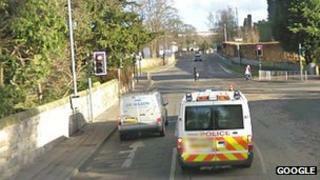 Emergency services were called to the crash in Newbattle Road, Dalkeith, Midlothian, at 17:15 on Wednesday. The roof of the car had to be cut off to free the 36-year-old driver, Lothian and Borders Fire and Rescue said. The 17-year-old passenger got out of the vehicle without help. They were taken to Edinburgh Royal Infirmary. The driver is being treated for leg and head injuries and the passenger for a head injury. A spokeswoman for the fire service said the injuries were serious but not life threatening. Meanwhile a 64-year-old man was also taken to hospital with serious injuries after crashing into a parked van. The man was travelling alone in a silver Honda CRV when it crashed in Main Street, Dunshalt, Fife, at 18:00 on Wednesday. Ch Insp Adrian Annandale, of Fife Constabulary, said: "We are currently investigating this collision and I would appeal to anyone who may have witnessed it or indeed has any relevant information to contact the police."